Idiyappam means mostly i remember my mom's place.She got a small wooden press with copper plate.She does it along with idli steaming on other side and whenever i try to stand next to her to watch the process,she finishes it sooner and wipe the place.On other side,my dad (doctor) get the calls from patients(who are in dialysis or underwent surgery) asking what they supposed to eat.My dad in milder tone says idly or idiyappam.This happens almost every day.Is this the food are we walking towards to? ?.The food must be taken before Aaaadi adangum moone period.Wont those instant noodles or dry version of sevai are considered forever? ?...Fast forward the scene at my home,I tried once for lunch and dinner.It was such a pain stacking job to press the dough out of tiny holes and the process , i never ever want to try it again.My hubby says why you want to try it when you can always buy them.So my mom loves her pethi comes running for second serving because her daughter never makes it.But i know i make it one day in a jiff like my mom ,it hardly takes 15 minutes(believe me it does). 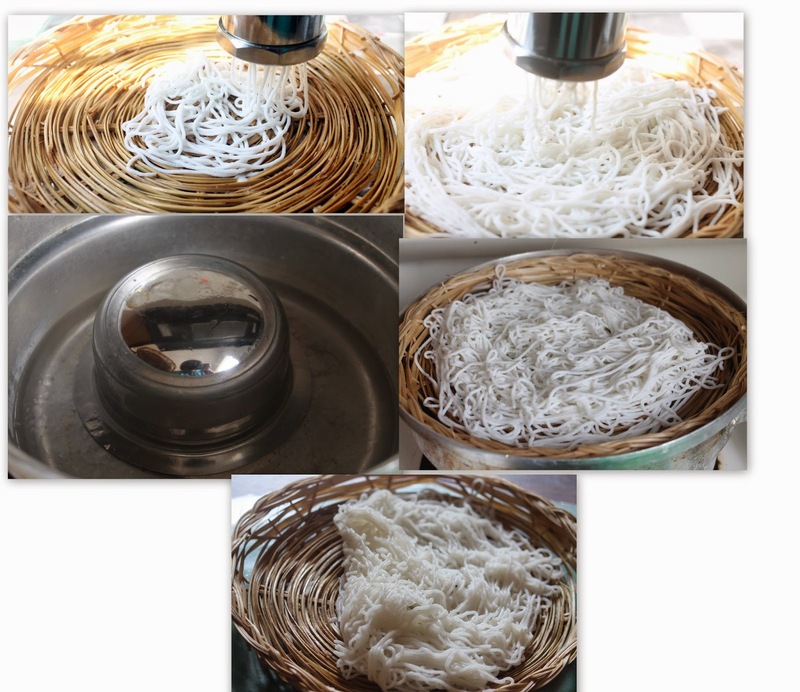 4.If you have 3-4 plates,the process is easily.Once the dough is ready,squeeze it in each plate and leave it aside,Steam them one by one.Stock the cooked idyappam in an air tight box and make as many dishes as you like. 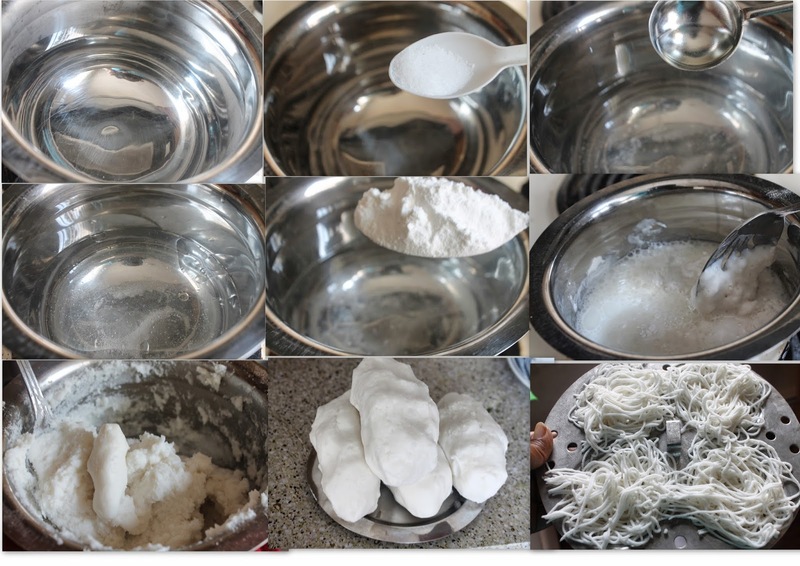 3.I dont recommend plain rice flour for this dish, u should try with idiyappam flour which comes handy in many brands. 5.If the dough is dried out by any chance,steam it as cylindical form for 2-3 minutes and use it again. Please dont ignore this dish,its easily digestible and kids will love it. Super like, my all time favourite food. love it with coconut milk and sugar..OMG!!!!!!!!! missng ma home!!!!!!!!! Never tried before.... But looks easy and tasty!! Awesome idiappam Priya.Ages since I made some my daughter loves them a lot. Thank you for dropping by my blog dear. Iddiyappam looks so delicious and inviting. Would try to prepare it very soon. Love this with coconut milk, yumm.. Tempting & inviting idiyappam... I'm so looking forward to making this some time. Delicious idiyappam I like the bamboo plates method.